L’Occitane’s fragrances are surprisingly good for a bath and body company. But L’Occitane’s offerings tend to be a bit more complex than stuff at Bath and Body Works. 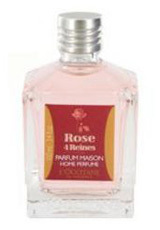 4 Reines was one of the first fragrances I tried from L’Occitane and it was a very nice, modern rose composition. In Bottle: Rose, rose, and more rose. There’s a bit of classic rose in this but 4 Reines mostly represents a very competent modern, clean rose. Applied: Clean, bright, dewy rose that’s very young and very modern. There’s a big difference between a classic rose scent and a modern one. I suppose a review of 4 Reines is as good a place as any. A classic rose to me (or old fashioned rose) has more depth and more density to it. There’s this sense of complexity to it that tends toward a bit of powderiness. A modern rose–like this fragrance–is usually clean, crisp and fresh. It’s youthful and easier to like and a bit watered down but that helps make it easier to wear. I smell modern rose in almost everything these days and classic rose in increasingly smaller and smaller amounts. Anyway, 4 Reines smells like a full on modern rose. A very well done one too. Extra: 4 Reines, true to its name as a fragrance that contains four rose scents was composed by Karine Dubreuil who also composed Gucci Envy Me and Just Cavalli Her. Design: A nicely designed square glass bottle that looks pretty unassuming. It has a pretty 80s-esque label on it. The rest of the bottle looks just as unassuming with very frills or thrills. It’s just functional. Notes: Rose, Turkish rose, Moroccan rose, Bulgarian rose. It’s light, it’s clean, it’s dewy and if you love rose then you’ll love this. There’s little else in the fragrance for it to progress much. If you love a more classical rose, then 4 Reines might not be for you and I may suggest something a bit older like Guerlain’s Nahema. Reviewed in This Post: 4 Reines, 2010, Eau de Toilette. This entry was posted in floral, loccitane, Reviews By House and tagged Bulgarian rose, moroccan rose, rose, turkish rose. Bookmark the permalink.